Figure: (A) Schematics of the experiments probing the non-equilibrium dynamics emerging when an initially prepared density wave of ultracold atoms in an optical lattice is subjected to a tunnel coupling and inter-particle interactions. (B) The experimental data is well reproduced by parameter-free numerical simulations (black line) which however break down for longer evolution times. Here, the experiment (blue circles) can still deliver reliable results, serving as a quantum simulator of many-body dynamics. By following the dynamics of a quantum system of strongly correlated ultracold atoms in an optical lattice, a team of physicists has demonstrated the superiority of a dynamical quantum simulator over state-of-the-art numerical calculations. The key prospect of a quantum simulator is to access new physics that the best known classical algorithms can no longer keep track of. For the first time, a group around Professor Immanuel Bloch (Max Planck Institute of Quantum Optics and Ludwig-Maximilians-Universität Munich), in collaboration with theoretical physicists from the Ludwig-Maximilians-Universität Munich of the group of Prof. Ulrich Schollwöck, the Forschungszentrum Jülich, the Institute for Advanced Study Berlin, and the University of Queensland (Australia), has demonstrated this superiority by following the dynamics of a quantum system of strongly correlated ultracold atoms in an optical lattice. In particular they were able to follow the relaxation of the isolated system which was initialized in a state far from equilibrium. The experimentally observed dynamics were in excellent agreement with numerical calculations which are available only for short evolution times (Nature Physics, AOP, 19 February 2012, Doi:10.1038/nphys2232). This demonstrates that many-body systems of ultracold atoms can be used as quantum simulators in a regime which is not accessible for classical computers. The concept of thermalization and thermal equilibrium is fundamental to a large part of our everyday life. It explains, for example, how hot coffee in a cup cools down to room temperature while also heating the room a little, and how the motion of the molecules in the coffee that is induced by stirring it with a spoon will dampen out until everything is at rest again. The answer to the same fundamental question posed in the context of a closed quantum system of interacting particles brought out of equilibrium remains elusive to the present day. The complexity of the underlying quantum dynamics as well as the possibility of the quantum particles to become entangled with one another makes even sophisticated numerical methods fail in the attempt to address this problem for large particle numbers and long timescales. Experiments with ultracold rubidium atoms carried out in the group of Professor Immanuel Bloch now allow the scientists to follow the non-equilibrium evolution of an interacting quantum many-body system on a time-scale much longer than those accessible by exact numerical methods. In the experiments, an extremely cold gas of rubidium atoms was loaded into an optical lattice: a periodic structure of bright and dark areas, created by the interference of counter-propagating laser beams. In this structure, the atoms are held in either dark or bright spots, depending on the wavelength of the light, and therefore align themselves in a regular pattern. The use of an additional light field with twice the spatial period allowed the scientists to pairwise group adjacent lattice sites in an optical superlattice and to further manipulate the regular pattern to obtain a configuration with alternatingly filled and empty sites along one spatial direction. Starting from this ’density wave’ state far from equilibrium, the atoms are then allowed to tunnel along the same spatial direction and to collide with one and another, leading to a complex many-body dynamics. After a certain relaxation-time, the system’s properties were read out in terms of local densities, tunnel currents and nearest-neighbor correlations with the help of the superlattice. These observables were probed for a variety of lattice heights and evolution times, showing a rapid relaxation to (quasi-) steady state values. 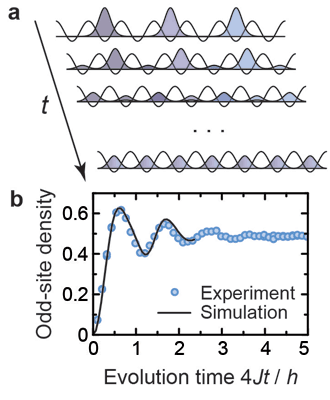 On short timescales, parameter-free numerical simulations carried out by collaborators of several research institutes could track the many-body dynamics and therefore benchmark the experimental quantum simulation. For long evolution times, however, these classical methods have to fail for the concomitant entanglement growth rendering a classical description infeasible. The experiment, on the other hand, tracks the evolution well beyond the time scale of theoretical predictions. This demonstrates that this system of ultracold atoms can be used as an efficient simulator for relaxation physics in many-body systems and is outperforming the best classical simulation so far. Furthermore, the experiment gives insight into quantum mechanical tunnel processes as well as (quasi-) steady state properties after relaxation. It opens up new avenues in the study of cold atoms in non-equilibrium which leads to a better understanding of fundamental problems in condensed matter physics. Be the first to comment on "Ultracold Atoms as Quantum Simulators"